When opening or start a program and the program window is already open, here is the solution to open a new program window under Windows 8, 8.1, 10! 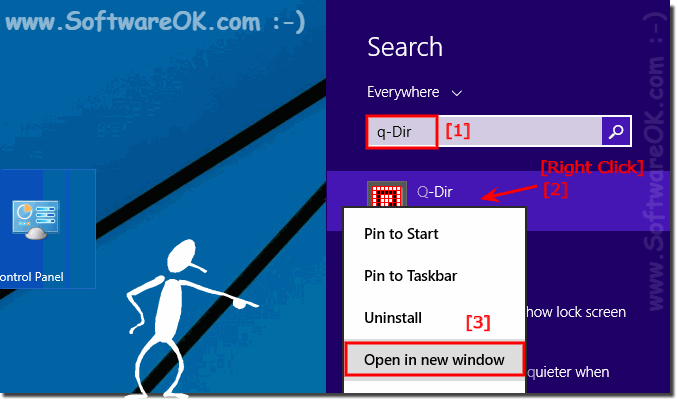 Hold down the Shift key while simply open the new window on the Windows Start! TIP: CTRL and Shift keys simultaneously corresponds to Run as administrator! Or click on the program icon with the right mouse button and select the option: "Open in New Window"! (Image-1) New Window for a program instance via Windows Start 8.1, 9! Windows-8 - FAQ-193: Open a new program instance or window via Windows Start (8.x, 10)! Can I open Start a New Program-Window on Windows 8.1? Why opens with Windows 8.1 Start no new window opens but the old is Focused or Housed in the foreground? Why Starts in Windows 8.1 not in a new program window on Windows start, what am I doing wrong?